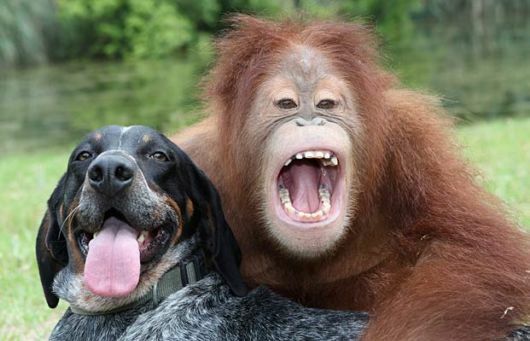 Experts found that although chimps may be known as the brains of the animal kingdom, sometimes only dogs get the point. Scientists pointed at one of two objects, asked for it to be brought to them, and counted up how many times their orders were obeyed. In the study, the dogs did better than the chimps, despite the chimpanzee’s brain being the more similar to the human brain. The research team, from the Max Planck Institute in Leipzig, Germany, placed pairs of similar-looking objects, such as a piece of hosepipe and a piece of rope, at the back of a room. The researchers then pointed to the one they wanted, while order a dog or chimp standing with its back to the objects, to fetch the correct one. If it did as asked, it was given some food as a reward. Babies are capable of following such orders from the age of 14 months, suggesting the task is relatively simple, at least for the human brain. Despite this, none of the chimps picked the object that had been pointed out at a rate that was higher than chance. However, more than a quarter of the dogs appeared to understand the task, the journal PLoS ONE reports. The German scientists suggested their results could be explained by pet dogs being bred to follow orders. The scientists said: “Dogs’ special receptiveness to human co-operative communication makes them the perfect social tool for certain activities like herding and hunting. Previous research has concluded that dogs make better pets than cats – but only by a whisker. In the comparison of 11 traits from brain size to environmental impact, dogs came out on top in six categories to cats’ five. But cat lovers may have the last laugh, with other research concluding that they are the top dogs for brains. A British study found that people with university degrees are more likely to have a cat than a dog.